Yangshuo County, the area surrounding a popular tourist resort town, boasts a landscape featuring all the ingredients necessary to attract a flood of tourists. On the 15th (Mon), explore the striking landscape at Moon Hill, make a trip to West Street, then explore the activities along Yulong River, and finally make a trip to Jiuxian Ancient Village. Get ready for a full day of sightseeing on the next day: explore the landscape on two wheels at Bike Asia Cycling Tours and then identify plant and animal life at South China Karst. To find traveler tips, other places to visit, more things to do, and more tourist information, read our Yangshuo County travel itinerary planner . Singapore, Singapore to Yangshuo County is an approximately 10.5-hour flight. You can also drive. Traveling from Singapore in April, things will get a bit cooler in Yangshuo County: highs are around 28°C and lows about 19°C. Wrap up your sightseeing on the 16th (Tue) early enough to drive to Longsheng County. The highlight of a trip to Longsheng County is undoubtedly its terraced rice paddies. 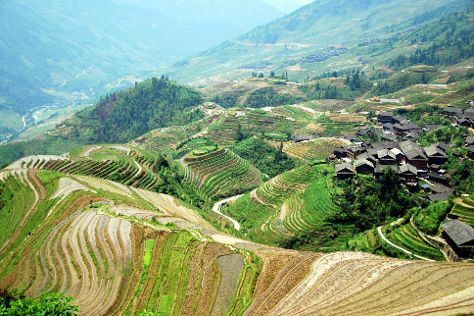 On the 17th (Wed), admire the landmark architecture of Jin Zhu Zhuang Nationality Village, take in the awesome beauty at Longji Mountain, and then don't miss a visit to Dragon's Backbone Rice Terraces. To see ratings, more things to do, and tourist information, read Longsheng County trip tool . Traveling by car from Yangshuo County to Longsheng County takes 2.5 hours. Alternatively, you can do a combination of bus and taxi; or do a combination of taxi and train. Wrap up your sightseeing on the 17th (Wed) to allow time to travel to Bama County. On the 18th (Thu), contemplate the waterfront views at Panyang River and then explore the fascinating underground world of Crystal Palace of Bama. To find where to stay, photos, maps, and more tourist information, refer to the Bama County online trip maker . Drive from Longsheng County to Bama County in 9 hours. Alternatively, you can fly. Finish your sightseeing early on the 18th (Thu) to allow enough time to travel to Guangzhou. A massive metropolis and critical international trading hub, Guangzhou sprawls along the Pearl River, distinctly vibrant and cosmopolitan. On the 19th (Fri), look for gifts at Beijing Road Shopping District, step off the mainland to explore Shamian Island, and then don't miss a visit to Canton Tower. For where to stay, ratings, and other tourist information, read our Guangzhou itinerary planner . Use the Route module to find suitable travel options from Bama County to Guangzhou. In April, daytime highs in Guangzhou are 31°C, while nighttime lows are 22°C. Cap off your sightseeing on the 19th (Fri) early enough to go by car to Shenzhen. A fairly humble collection of farming and fishing villages and towns until 1979, you wouldn't guess as much when taking a tour of Shenzhen. On the 20th (Sat), find something for the whole family at China Folk Culture Village and then find something for the whole family at Shenzhen Window of the World. For more things to do, other places to visit, maps, and more tourist information, read Shenzhen road trip planning website . Traveling by car from Guangzhou to Shenzhen takes 1.5 hours. Alternatively, you can do a combination of subway and train; or take a bus. April in Shenzhen sees daily highs of 31°C and lows of 24°C at night. Finish up your sightseeing early on the 20th (Sat) so you can travel back home.